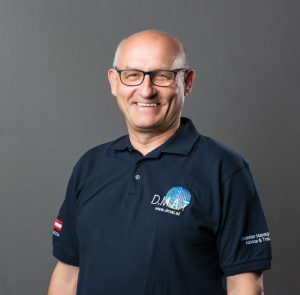 Prof. Dr. Alois Hirschmugl - D.M.A.T. Prof. Dr. Alois Hirschmugl is the founder and managing director of D.M.A.T. Consulting KG. He runs the business together with Mag. Monika Hirschmugl-Fuchs and he is primarily responsible for the specialist content in the disaster management, preparation and prevention. His extensive experience in international disaster relief operations in the United Nations, as well as in the European Union is an important competence for the company. and lecturer, he teaches and provides information for example, in the international disaster management, in legal aspects of disaster response and peace support operations and in the socio-economic impact of disasters or civil-military cooperation, at the international and national organizations, universities and government officials. As a member of the Austrian Standards Institute participated Prof. Dr. Alois Hirschmugl in the development of standards for integrated operational management in the event of a disaster. He is the author of the Handbook for Peace Support, Humanitarian and Disaster Intervention, and he continues to apply his expertise to scientific work and studies. As a board member of the Humanitarian World Forum Geneva, he was able to support the global development of humanitarian issues. He shows also by his membership in the ARGE proEthik his professional ethical principles. A summary of UN Disaster Relief and Coordination Mission in South-East Asia as PDF can be download: Tsunami-South-East-Asia-2005 . In July 2011, there was an explosion in a naval base in Cyprus. The largest nearby power generating station on the island was destroyed during the explosion. Prof. Dr. Alois Hirschmugl was on site with 14 other members of the EU civil defense team. During this mission, drones were first used to explore areas that were inaccessible. Furthermore, satellite images and developments from the GEO-PICTURES Project were used. At the end of March 2014, a disaster preparedness course was organized by UN OCHA the UN department for the coordination of humanitarian affairs in Palestine. To ensure the efficiency of operations, as well as the safety of the emergency responders and the people who affected by disasters, recurred regular refreshing obligated courses for all UNDAC members. Participation in Langenargener Symposia in 2008, 2009 and 2010: the annual meeting of representatives from Germany, Austria and Switzerland, the military and civil emergency, disaster and rescue medicine with the aim of promoting technical assistance and military, medical services, as well as international cooperation. Congress “Leadership and Management in Disaster Operations” in 2009, in health resort Bad Neuenahr. Annual Meeting of the Global Disaster Alert and Coordination System (GDACS) in 2007. EULUX 2007: the European Union Workshop on Disaster Management and Coordination in the Field in Luxembourg. The presentation (in English) can be downloaded in PDF format: EULUX presentation.